A pair of veterans returned low. ABC: A short DANCING WITH THE STARS edition premiered at 1.1, its lowest start ever and down 0.3 from Fall 2017. THE CROSSING dropped 0.2 to 0.5. CBS: The sitcoms returned from a week off, with KEVIN CAN WAIT (0.8) down 0.1, MAN WITH A PLAN (0.8) steady, and SUPERIOR DONUTS (0.7) down 0.1. 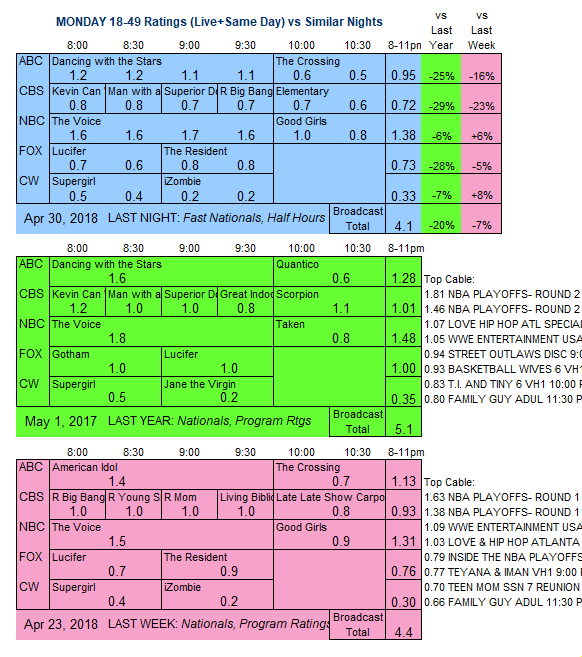 The season premiere of ELEMENTARY was down 0.2 to 0.6 compared to its last premiere. NBC: THE VOICE rose 0.2 to 1.6, and the season finale of GOOD GIRLS held at 0.9. 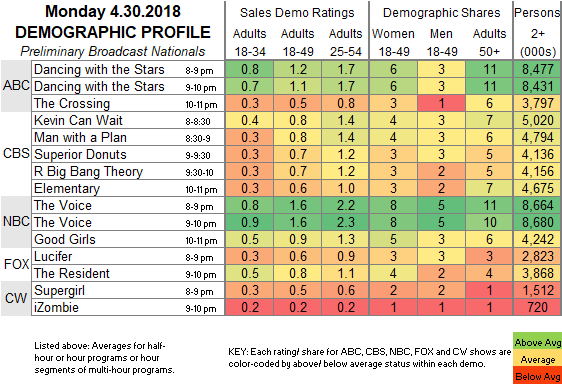 FOX: LUCIFER (0.6) and THE RESIDENT (0.8) were steady. CW: SUPERGIRL gained 0.1 to 0.5, and IZOMBIE remained at 0.2. Tonight’s season finales include FOX’s LA TO VEGAS and USA’s UNSOLVED.